Miss Molly Says and Mom Does Reviews are VERY EXCITED to share this great opportunity with YOU! Giveaway hops are fun and you can win lots of prizes! 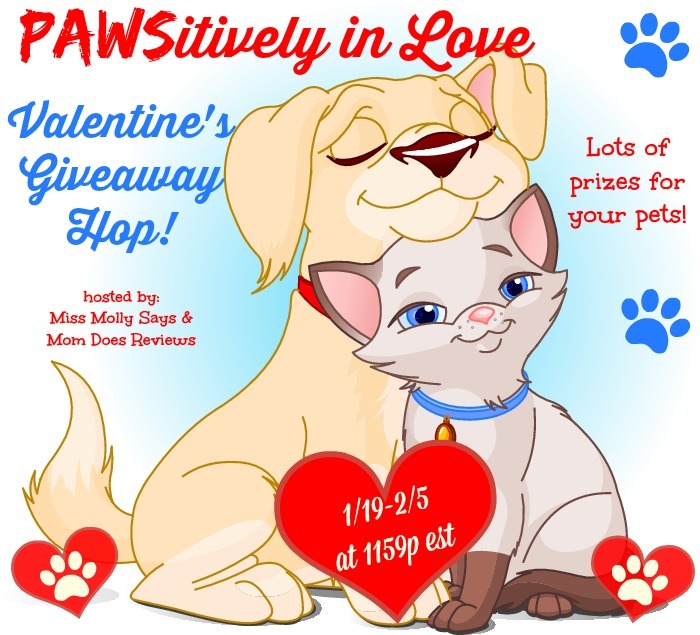 The bloggers joining us have some great prizes- anything from PayPal to Dog Ramps to Dog Mom Mugs! One lucky reader will win their choice of Petco GC or PayPal Cash! Well, I think I’d want to be a golden retriever. Mainly, that’s because I have that breed of dog. So, no big reason or anything. Lol. I would want to be a Cocker Spaniel because they are so lovable. I would be a Pug because of being small and spoiled, or I would be a German Shepard because of being able to move and protect. A Pomeranian because they’re so fluffy and cute! I would love to be a Shih Tzu because they are small and so cute!! I would want to be a terrier because they are very popular. I would want to be a shepard. Strong and able yet timidly loveable. ooh.. thats a hard one. I think a German Shepard. you have a cuteness to you, but you gain the respect of others easily. I would like to be a German Shepherd because I think they are fun and have a lot of energy. I would want to be a Shitzhu because they are so cute, sweet, fluffy and everybody loves them! I would want to be a lab because they are smart. I’d be a German Shepard so I could be a police dog. I would like to be a rotweiller because I would be big and protective of my family. I’d want to be a Belgian Malinois because they’re athletic and smart and strong and handsome. I think I would want to be a Husky. I think they are absolutely gorgeous! Always wanted one. I like German Shepard for they are protectors and very smart dogs. They also are so beautiful. I would want to be a collie shepherd. They are super fast, strong and playful! I would want to be a toy rat terrier. They are cute, small and get to cuddle on laps all day. I would want to be a tiny dog that could be carried in a purse, such as a Yorkie. They are so cute. Definitely a Brittany. They are so sweet and super smart. I would want to be a German Shepard because they are beautiful and smart! If I was a dog I would be a corky because I am short. I would like to be Zoey, my Brothers West Highland Terrier 🙂 She is loved so much and treated like a Princess!! I would be a beagle just like the one I have, very cute and loyal but also naughty at times. I would want to be a Siberian Husky because I think they’re so beautiful and loyal. Border collie or sheltie… intelligent, loyal, always ready to go. I would want to be a German Shepherd. They are fearless! I would want to be a German Shepard because that’s my all time favorite breed. I have four rescued Treeing Walker Coonhounds. That’s what i would want to be. I love the breed (why else would I have so many? and I’m planning on adopting another one soon). They are sweet, loving, and very playful (although not the brightest bulbs on the Christmas tree). I would want to be a teacup yorkie because they are so cute and they are small enough to fit in a bag or purse and go wherever my person goes. I’d want to be a jaack russell terrier because they are cute. I would want to be a great dane. They are regal, smart and attention getters. I’d like to be a West Highland White Terrier because they are cute, sweet, and loyal. I would be a St. Bernard so I could carry a keg of brandy around my neck. A German Shepard because they are strong, protective and loyal! I would want to be a St Bernard. They’re great for finding/tracking people. A beagle because they are the cutest and the sweetest. A mutt, because as I understand it they’re genetically healthier. A little dog like a Yorkie so I could sit on laps and just be cute. I would be a golden retriever, they are a bigger god and friendly. I would be a French Briard beautiful long hair and so playful. I would want to be a playful and silly mut. A little bit of everything all rolled into one great dog. I’d want to be a little dog that is carried around all the time…LOL!! I would love to be a Golden Retriever! We had one growing up and they are the nicest most selfless dogs with a smile on their face constantly!! I love them! I would be a German Shepard, because they are great dogs & I love mine. I think I would like to be a German Shepherd. They are so very loyal. I would want to be a toy poodle, because they are cute and they are dogs that people usually spoil rotten. I’d be a boxer, because they’re strong and playful. I would like to be a Husky and live in Alaska. I’d probably be a German Shepherd Dog. Smart, Independent, and sensitive. I would like to be a German Shepherd and a K-9. I’d want to be a parti color mini schnauzer because they are so pretty and smart. I would like to be a German Shepherd because I think they look so noble and smart. An Irish Wolfhound. A REAL DOG! I’m a family person, so I would be a lab or a golden retriever. I would want to be my dog who is a mixed breed of border collie and red heeler, he’s smart and sweet. I would want to be a mutt because they are the cutest, healthiest doggies! I would want to be a Shiba Inu because they’re adorable and goofy and I feel like it fits my personality. Golden Retriever because they’re sweet. I’d want to be a Scottie so I could wear plaid and it wouldn’t be questioned. I would love to be a Golden Retriever-they are always happy and loveable. I would be a foo-foo dog with shorter hair, so Paris Hilton could adopt me, pamper me and take me everywhere. I would want to be a Shitzu because they are cute, sweet and everybody loves them. I’ve always loved Golden Retrievers but I now also love Pitties and any kind of lap dog. Thank you for the giveaway. A golden retriever because they seem so friendly and everyone likes them. They are such a beautiful dog. They are loyal. i would like to be a husky because they are great family dogs and are very strong . I would be an English Bulldog because they are so full of character! I would be a Yorkist! Everyone takes them everywhere and treats them like princesses! I’d want to be a hard-working, fun-loving Australian Shepherd. I would be a beagle because I’m always on the hunt for an adventure. I would want to be a German Shepard as they are so pretty and smart! I would want to be a Boxer. They are so much fun and lovable. They stay “young” mentally longer than other breeds. Oh I would love to be a lab! Gentle…loves playing catch! Love the playful attitude! I’d want to be a Husky so I could be stubborn! I would choose to be a German Shepherd – I think they are very smart and brave. I would want to be a Corgi because they are so adorable. I’d like to be a toy poodle. An inside and spoiled dog sounds good to me. I would be a Cocker Spaniel because they are so cute and wonderful dogs. I’d probably be a larger do like a Golden Retriever or one of those sheep herding dogs! Although I think my cats would be pretty grumpy having a dog around! If I were to be a dog I would want to be a pit/lab mix like my dog because he is seriously the most loving, perfect dog out there. He is my world- and such a great family dog! a tea cup pup i would be held all the time and taken everywhere!! I would choose a labrador retriever. They tend to have great temperaments. I think a poodle because my hair would always be no problem and stylish. I want to be an Alaskan Malamute. Very majestic dog and their coat is perfect for playing in the snow. a greyhound! they’re incredibly graceful!!! I would want to be a lab because they are the happiest and friendliest dogs. I work in a vet so this is soooo hard to answer. I think today I would want to be a Caucasian Shepherd because they are humongous and awesome! I would be a Pomeranian because some of my ancestors came from the area in Northern Europe that was called Pomerania. I believe that’s where the breed originated. I would want to be a dalmatian! I love spots! Despite my family disagreeing, my dog needs another squeak toy! If I were a dog I would love to be a Husky or a Rottweiler. I would be a poodle, because I have curly hair. I would be a Chihuahua so I could run around and bark and act big and then sit on various laps. I would be a Great Dane because I love to snuggle and be around people! I also love to be lazy! Hmmm…I’d want to be a Collie so I could be thin with luxurious hair! Thanks and God bless! I would be a Golden Retriever, because they are great dogs. A golden retriever – family oriented and loyal. I would love a siberian husky! I would be a hound. They’re very loyal, single minded, playful, loving, not too snuggly and very sweet. Hmmm….great question. I would be an English Bulldog because they’re happy being lazy but they’re also good at learning tricks. I would be a loab because I am friendly and loyal. I like labs because they eat all the time. I like cocker spaniels or other small dogs because everyone plays with them all the time and lets them sleep on the bed. I would like to be a chocolate lab because they have such sweet disposition and they are great with children. German Shepherd because they are very smart and loyal dogs. I would want to be a border collie as they are very smart dogs. Thanks for having this giveaway! I would be a chihuahua because they are adorable and so intelligent. I would want to be a lab because they are always so sweet and happy. If I were a dog, I would be an English Springer Spaniel. They are so darn cute, why not? I would want to be a bull dog…chilling with all my wrinkles and still be adorable and can get away with sleeping all day! I would definitely be a Rottweiler. I would definitely be a Rottweiler because they are no nonsense and get their point across without making a sound!